Financial job carnage has already been announced. Layoffs in the financial sector may affect 80,000 or more. Cash strapped cities and states are shedding workers. Housing is abysmal. To top it off, Retail jobs carnage is just around the corner. Gap will close 189 stores in the US and instead expand in China. Lowes announced today it will close 20 stores affecting 1,950 employees. Best Buy plans to reduce square footage by 10%. 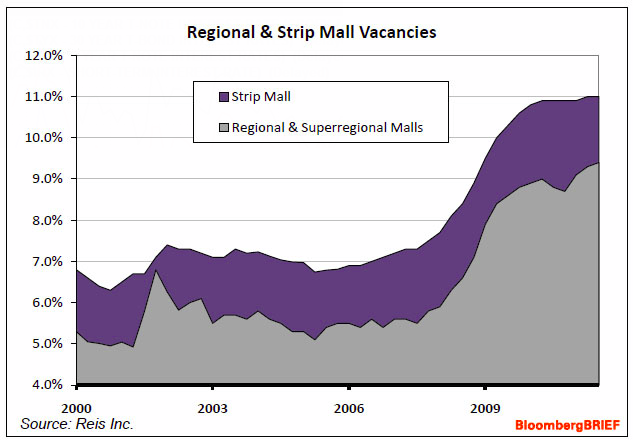 Regional and strip mall vacancies are at record highs already. How many trucking jobs will that cost? How many manufacturing jobs? Note the implications on commercial real estate rents and prices. Today Citigroup set aside lower reserves for losses. What a farce. Let's take a look at some of the retail stories. Lowe's Cos. is shutting 20 of its home-improvement stores and greatly slowing future openings in an effort to improve its profitability. The closings affect about 1,950 employees, and the retailer will book a related second-quarter charge of $345 million to $415 million, or 17 cents to 20 cents a share. The company now expects to open 10 to 15 stores a year in North America from 2012 forward, down from its prior assumption of about 30 stores a year. Lowe's will open about 25 stores this year, as planned, having already committed to the sites. Lowe's closed 10 stores on Sunday and said it would shut 10 more within a month. "Today we have a clearer view of the long-term economic recovery and decided to close these 20 stores," Lowe's spokeswoman Chris Ahearn said. "The stores have under-performed and we haven't seen progress necessary for them to reach profitability." The struggling retailer, which runs the Gap, Old Navy and Banana Republic chains, detailed plans on Thursday to close 189 locations, or 21 percent of its namesake Gap stores in the U.S., by the end of 2013. At the same time, the largest U.S. clothing chain said it plans to triple the number of Gap stores in China from about 15 by the end of the year to roughly 45 by the end of next year. On Thursday, Gap officials offered more details to analysts gathered in New York for its annual meeting. The company said that it plans to have closed 34 percent of its namesake Gap stores between 2007 and the end of 2013, not including Gap Outlet locations. After the reduction, it will have 700 Gap stores left by the end of 2013, down from 1056 in 2007. In July, as financial sector layoffs mounted, a top executive search firm estimated as many as 80,000 jobs might go in this coming round of financial layoffs. Job cuts on Wall Street are nothing new. The industry is well known for its sponge-like quality, absorbing bankers when times are flush, squeezing them from the ranks when the business cycle slows. Hire, fire, repeat. But the most recent rounds of cuts—5% or more at Goldman Sachs Group Inc., 400 to 600 employees at Credit Suisse Group Inc. and a combined 700 jobs at Barclays PLC since the start of the year—could snap the trend. Those jobs might not come back for a long time. Goldman is even shipping some jobs to Asia. The securities industry still employs about 800,000 people nationwide, according to the Securities Industry and Financial Markets Association. That is only 7.8% fewer than the all-time high, and roughly the same as in 2006, when Bear Stearns Cos. and Lehman Brothers Holdings Inc. still roamed the earth. It isn't a stretch to think that employment could fall to 2003 levels, meaning another 50,000 job cuts. And, in a worst-case scenario, the decline could feel like a throwback to pre-tech bubble days, when the industry employed 100,000 fewer people than at the end of March. This latest cycle has a something in common with layoff waves such as the purges of the late 1990s, the post 9/11 downsizing and belt-tightening during of the financial crisis: It is all business. The big difference, of course, is that unlike those employment trends in the past, there isn't much evidence that these jobs will come back this time. While the incremental bankruptcies in commercial REITs have been slow in coming primarily due to record low interest rates, the mall vacancy number just hit a new all time high. During the third quarter, vacancies at regional and super-regional malls rose to 9.4 percent from 8.8 percent a year earlier and 9.3 percent in the second quarter, according to the New York-based property research company Reis. This was the highest since data was compiled in 2000." Employment data reveal the trend away from hiring at establishments that sell goods easily purchased on the Internet like books and hobby supplies. The need to employ sales people at apparel and accessory stores has actually increased since sales assistance is a necessity. An extra large shirt is not the same across all brands, and footwear sizes vary greatly. Colors can mislead on the web. Where the Hell are the Jobs Going to Come From? I keep asking where are the jobs going to come from? I posted the above table in November of 2009. The key years are 1999, 2005, and 2006. Chart courtesy of BLS. Annotations by me, numbers are in thousands. The areas in deep blue mark recessions. At the height of the internet bubble with a nonsensical Y2K scare on top of that, the economy managed to gain 264,000 jobs a month. At the height of the commercial real estate bubble with massive store expansion, the economy added somewhere between 96,000 and 178,000 jobs per month depending on where you mark the peak. Neither the housing boom, nor the commercial real estate boom is coming back. Nor is there going to be another internet revolution. Government is not the answer nor are Keynesian make-shift work programs that will hire a few union workers at monstrous costs, fixing little. We need to fix structural problems.